This was precisely what happened in Poteau, Oklahoma on Thursday, January 25, 1934. 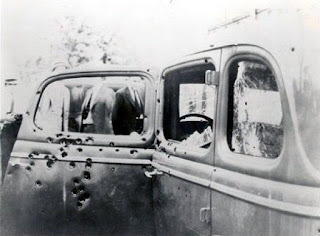 Shortly before noon, Clyde and his gang drove the stolen blue Plymouth sedan down Dewey Avenue, turned right on to McKenna, and parked just outside and towards the rear of Central National Bank. Dressed in expensive-looking suits, Clyde Barrow and Raymond Hamilton got out and calmly walked through the front door of the bank. Joe Palmer remained in the car with the engine running, waiting for their return.